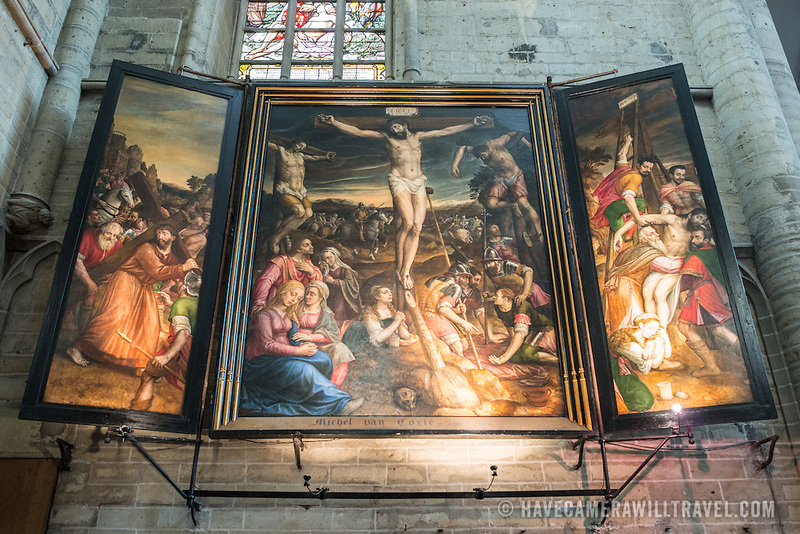 A triptych painting of the crucifixion of Christ at the Cathedral of St. Michael and St. Gudula (in French, Co-Cathédrale collégiale des Ss-Michel et Gudule). A church was founded on this site in the 11th century but the current building dates to the 13th to 15th centuries. The Roman Catholic cathedral is the venue for many state functions such as coronations, royal weddings, and state funerals. It has two patron saints, St Michael and St Gudula, both of whom are also the patron saints of Brussels.